NASA Earth Observatory images by Lauren Dauphin, using MODIS data from NASA EOSDIS/LANCE and GIBS/Worldview. Story by Kasha Patel. The 2018 fire season in California has been record-breaking. The Mendocino Complex in July was California’s largest fire by burned area on record, destroying nearly half a million acres. The Camp Fire in November was the deadliest and most destructive in state history, completely wiping out the town of Paradise. The image above shows the charred land—known as a burn scar—from the Camp Fire, which has destroyed more than 18,000 structures and caused at least 85 deaths. The fire, which has burned more than 153,000 acres, is now fully contained, according to the California Department of Forestry and Fire Protection. 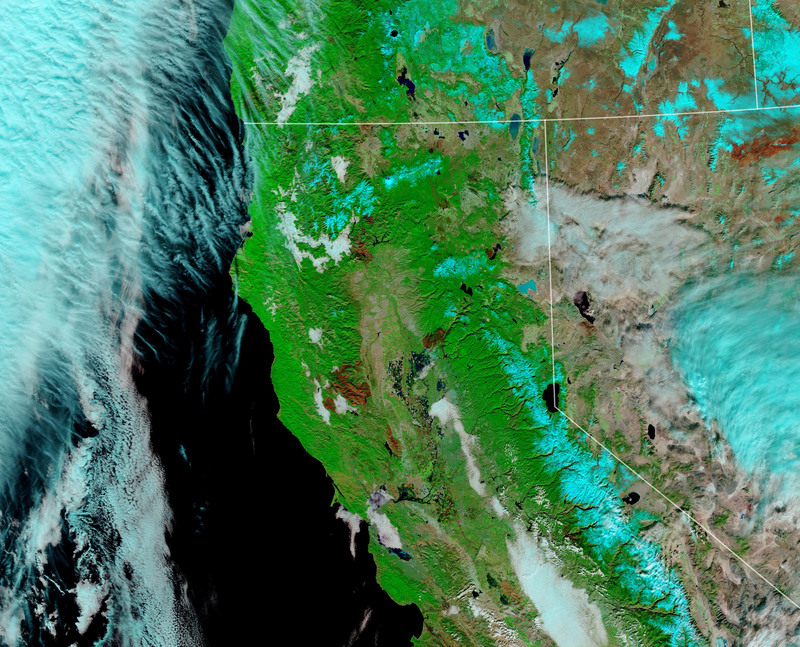 This image was acquired by the Moderate Resolution Imaging Spectroradiometer (MODIS) on NASA’s Terra satellite on November 25, 2018. 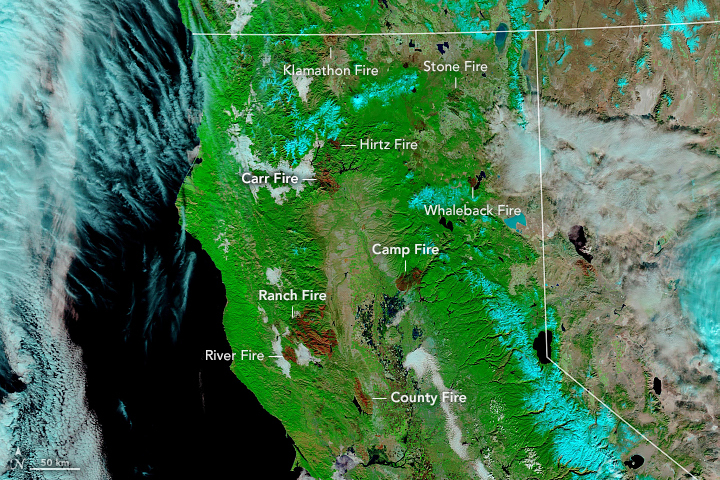 The second image shows a wide view of Northern California, where burn scars from nine major 2018 fires are visible from space. The image was acquired by Terra MODIS on November 25, 2018. Soja also noted that California had a really wet winter in 2017, which helped build up grass and brush in rural and forested areas. The vegetation was an abundant fuel source as California headed into the 2018 dry season, which was exceptionally dry and lasted into late October. 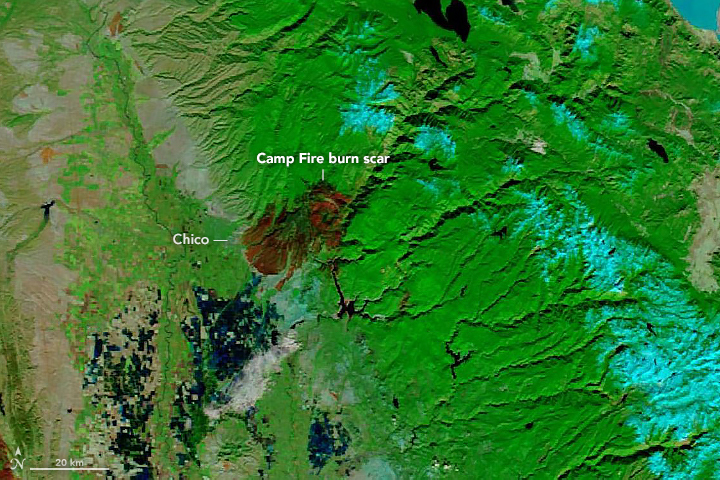 As fires are becoming more numerous and frequent, NASA’s Disasters Program has been working with disaster managers to respond to the blazes. For California’s Camp Fire and Woolsey Fire, NASA scientists and satellite analysts have been producing maps and damage assessments of the burned areas, including identifying areas that will be more susceptible to landslides in the upcoming winter. California Department of Forestry and Fire Protection (2018, November 25) Camp Fire. Accessed November 27, 2018. California Department of Forestry and Fire Protection (2018, November 25) Top 20 Most Destructive California Wildfires. Accessed November 27, 2018. Climate.gov (2018, Nov 16) Hot, dry summer and slow start to wet season primed California for November 2018 fires. Accessed November 26, 2018. Climate.gov (2017, October 10) Very wet 2017 water year ends in California. Accessed November 26, 2018. GIS Training and Research Center at Idaho State University (2018) Geography of Wildfires Across the West. Accessed November 27, 2018. NASA (2018, November 20) NASA Mobilizes to Aid California Fires Response. Accessed November 27, 2018. NASA (2018, November 19) Updated NASA Damage Map of Camp Fire from Space. Accessed November 27, 2018. NASA Earth Observatory 2018 Fire Season in the Western United States.